South facing, the house enjoys an exceptional view. At 5 minute walk from downtown and the beaches of Granville, the home is located in a very quiet area. With its large walled garden, it offers a very pleasant vacation. 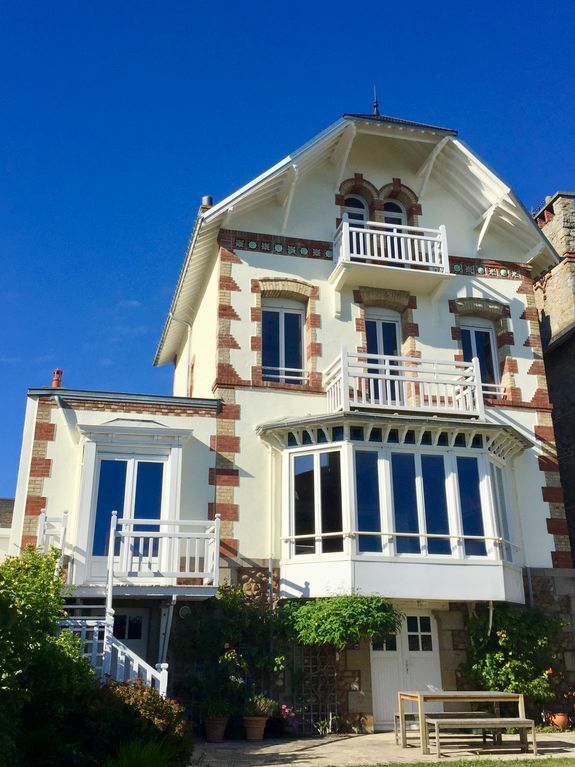 The minute we arrived, the warmth and beauty of this charming Normandy seaside villa embraced us. Everything about staying at this gorgeous home was exceptional. The house itself is charming, comfortable, well-outfitted and the view is extraordinary. We were two couples and had plenty of room, plus more. Philippe met us upon arrival and could not have been more helpful in terms of acquainting us with the house and neighborhood. It was easy to walk to town, past the lovely church and down the charming French alleys - and the town has everything you could want - plenty of great restaurants and shopping. We cooked dinner at home two nights and picked up delicious provisions for our meals - great wine, cheese, fish and bread shops in Granville. We are definitely planning a return visit. We stayed for a week in this lovely house with a family of six. The sea view from the house (living room and two of the front facing bedrooms) is simply mesmerizing. We loved the house and the garden and the city of Granville which is only a few minute walk from the house. The house is well maintained and clean and Philippe was very hospitable. We had a lovely stay and would recommend this property to anyone. With 4 bedrooms and 3 bathrooms, there is plenty of space in this charming home. There are 4 flights, so be able to climb stairs. The view is spectacular of the seashore and only gets better with each flight up. Two large bedrooms face the water, and the other two might be best for children. The owner has equipped the house with very new appliances (washer, dryer, coffeemaker, dishwasher, etc.). He has thought of everything possible for his guests. The WIFI was most reliable. The TV works fine, and the programs are all in French if you want to brush up on yours. It is close enough to walk to beaches, restaurants, casino and stores. There is a garage if you wish to park a vehicle. Beware the seagulls which fly constantly overhead, as you are quite near the water. The owner is most gracious and helpful and responds quickly to any request for information. He even found us a church service nearby. We highly recommend this property. La villa Léontine est un paradis, très bien situé dans Granville tout est accessible à pied (visite / commerce / restaurants). La villa est aussi jolie et bien entretenue à l'intérieure comme à l'extérieur, des chambres spacieuses, salon et coin véranda très agréable et lumineux, une jolie cuisine très fonctionnel, la villa est un bijou et le jardin est une vrai merveille. Nous avons passé un séjour de rêve. Maison très agréable, décorée avec goût, belle vue mer et grand jardin. Excellente situation, au calme, mais près des commerces et de la plage. Hôte très sympathique de surcroit. Nous sommes ravis de ce court séjour entre amis à Granville, de la découverte de l'archipel Chausey. Belles balades, météo chanceuse, belle lumière, golf comme on aime, et maison accueillante, bien équipée, cosy, dotée d'une vue mer panoramique. Granville is at the center of a beautiful area. Cotentin with its endless beaches and authentic Bocage offers great ballads. The Channel Islands, so exotic, are very close: Chausey, Jersey, Guernsey, Sark. Saint-Malo and Cancale are an hour away. Walking cross the bay to Mont St. Michel is a unique experience. La Haute-Ville, the Abbaye de la Lucerne, the cathedral of Coutances will delight lovers of old stones. To end with a bath and a gaufre on Plat-Gousset !